Join us for two short comedy performances by the Silver Theater group on January 31, at 1:00 and 7:00 pm in the Merkle Gallery as a Dessert Theater, with drinks and dessert being served before each showing. Both short comedies will be seen at each performance time. 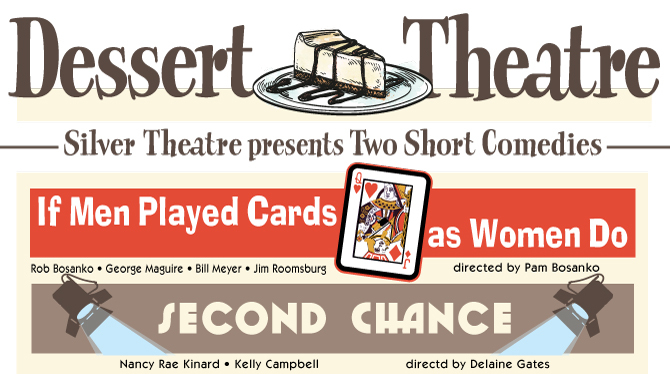 The first play is the superb dramatic comedy, “Second Chance” by Elyse Nass. SAAC stage veterans Nancy Rae Kinard and Kelly Campbell will star in this hilarious show, which will be directed by Delaine Gates. Kinard’s character, Evelyn, is in her mid 60’s, looking tired and letting things take their course, while Campbell’s character, Rita, is in her late 60’s, vivacious and full of life. Rita, a widow, has decided to begin a new life and her married neighbor, Evelyn, tries to put the damper on her aspirations. It is a delightful, yet poignant comedy, with wisdom and insight. This play has marvelous themes: Life is short, make every minute count and one is never too old to learn and grow. Originally published in the esteemed Chilton Publishing’s Best Short Plays series, it has had many productions in the United States and abroad. The second play, originally written as a Vaudeville skit, is “If Men Played Cards as Women Do”. It is a brilliant satire written by American playwright, theatre director and producer, humorist, and drama critic George S. Kaufman, which played in Irving Berlin’s “Music Box Revue.” The fun is derived from the fact that a group of men at the poker table speak, behave, and think in the manner in which women are supposed to conduct a bridge game. It seems like a typical scenario: a group of men getting together and playing cards, but it’s the conversation that’s NOT so typical. The four men, whose personalities are all over- the- top, try to “one up” each other during their usual card game. Hilarity ensues and trumps the evening! Rob Bosanko, George Maguire, Jim Roomsburg and Bill Meyer are cast as the poker playing foursome which will be directed by Pam Bosanko. John, Bosanko’s character, has established a way of living, a home of which he is very proud of and a circle of friends to which he is accustomed. He is the host of the poker game and therefore feels it necessary to do everything for everyone. Bob, played by Meyer, is the kind of person who has his nose in everyone’s business. Bob has an opinion about everything and everyone and is not afraid to share that opinion with anyone that will listen. George is your token “did you hear” or “did you try” person, always up on the” latest of the latest” and is played by Maguire. Mark, the “appearance man”, played by Roomsburg, is out to make not only himself but those around him perfection.